Washington (AFP) - The Earth set a series of dire records in 2016, including hottest year in modern times, highest sea level and most heat-trapping gases ever emitted, a global climate report said Thursday. 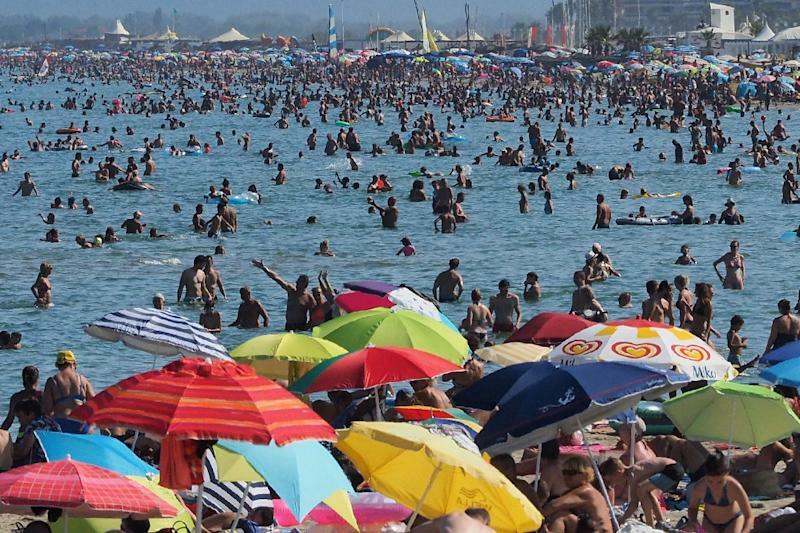 A range of key climate and weather indicators show the planet is growing increasingly warm, a trend that shows no signs of slowing down, said the annual State of the Climate Report. "Last year's record heat resulted from the combined influence of long-term global warming and a strong El Nino early in the year," said the report. 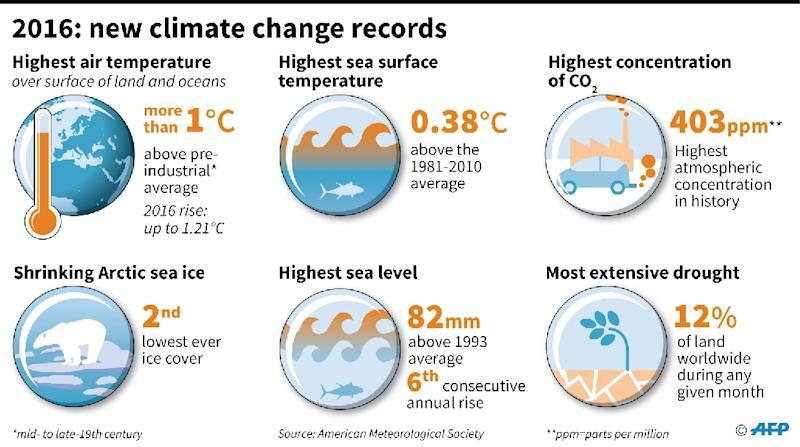 "The major indicators of climate change continued to reflect trends consistent with a warming planet," it added, noting that several markers -- such as land and ocean temperatures, sea level and greenhouse gas concentrations in the atmosphere -- broke records set just one year earlier. The ominous news comes two months after President Donald Trump announced the United States would withdraw from the 2015 Paris accord on global warming, a decision that sparked widespread international criticism. In the past billionaire Trump has called climate change "a hoax" invented by the Chinese, dismissing scientific evidence of human contributions to rising temperatures. But as humanity continues to rely on fossil fuels for energy unprecedented levels of greenhouse gases are polluting the atmosphere, acting like a blanket to capture heat around the Earth, the report emphasized. All the major greenhouse gases that drive warming, including carbon dioxide (CO2), methane and nitrous oxide, rose to new heights, it said. Atmospheric CO2 concentration reached 402.9 parts per million (ppm), surpassing 400 ppm for the first time in the modern record and in ice core records dating back as far as 800,000 years. "Climate change is one of the most pressing issues facing humanity and life on Earth," said the peer-reviewed publication, put together by nearly 500 scientists around the globe and released each year by the National Oceanic and Atmospheric Administration and the American Meteorological Society. The entire 280-page report is available online. The report confirmed prior announcements that 2016 was the hottest year since contemporary records began, marking the third year in a row that global records were broken planet-wide. Both land and sea surface temperatures set new highs. Melting glaciers and polar ice caps swelled the world's oceans, and global average sea level rose to a new record high in 2016 -- about 3.25 inches (82 millimeters) higher than the 1993 average. Global sea level has risen for six straight years, with the highest rates of increase seen in the western Pacific and Indian Oceans. In the sensitive polar regions, sea ice in both the Arctic and Antarctic hit record lows. Land temperatures warmed too -- average Arctic land surface temperature was 3.6 Fahrenheit (2.0 Celsius) above the 1981-2010 average. This represents a 6.3 F (3.5 C) increase since records began in 1900. Some extreme weather events increased, such as unusually high tropical cyclone activity. A total of 93 named tropical cyclones were observed worldwide in 2016, well above the 1981-2010 average of 82 storms. Record high annual temperatures swept Mexico and India. Over the northern and eastern Indian peninsula, a week-long heat wave at the end of April saw temperatures exceed 111 F (44 C), contributed to a water crisis for 330 million people and to 300 fatalities, the report said. Meanwhile, drought was unusually widespread. At least 12 percent of land surfaces experienced severe drought conditions or worse each month of the year. "Drought in 2016 was among the most extensive in the post-1950 record," said the report. Northeastern Brazil marked its fifth consecutive year of drought, the longest dry spell on record in this region. Meanwhile, the weather phenomenon known as El Nino, which warms waters around the equator in parts of the Pacific, was strong in the first half of 2016, leading to increasingly wet conditions in some places. Argentina, Paraguay, and Uruguay saw repeated heavy flooding, while parts of eastern Europe and central Asia were also wetter than usual. The US state of California had its first wetter-than-average year since 2012, breaking a drought that lasted several years.